Smoke rises from a strike on Baghuz, the last of the Islamic State group's holdouts in Syria, March 22, 2019. 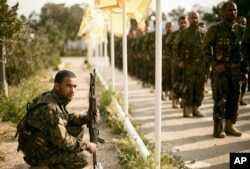 U.S-backed Syrian Democratic Forces were conducting "clearance operations" Sunday in the last area retaken from Islamic State, a day after declaring the end of the terrorist group's self-declared caliphate. By Saturday morning, all that remained was a landscape littered with burnt-out vehicles, abandoned campsites and other provisions the last of the terror group's fighters and their families left behind. "After five years of fighting, we stand here to declare the physical defeat of ISIS and the end of its public challenge over all humanity," SDF Director General Mazloum Kobani told officials and coalition partners at a ceremony to mark the long-awaited victory, using an acronym for the group. FILE - Mazloum Kobani, commander-in-chief of the Syrian Democratic Forces (SDF), speaks during an interview in the countryside outside the northwestern Syrian city of Hasakah, in a province of the same name, Jan. 24, 2019. "We announce today the destruction of the so-called Islamic State organization and the end of its ground control in its last pocket in Baghuz region," he said. 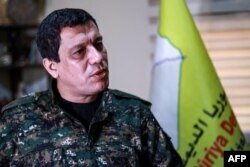 Yet in between the applause and the music of a marching band, SDF commanders and coalition official paid tribute to the SDF forces, which paid for the victory in blood and treasure — an estimated 11,000 killed in the campaign to roll back IS, which at its height controlled nearly a third of Syria and almost as much of Iraq. The exact fate of the last of the IS fighters, perhaps several hundred of the terror group's most hardened and devoted followers, was not clear Saturday. The first indications the fight against IS in Baghuz had ended came early Saturday, SDF spokesman Mustafa Bali using Twitter to announce the "total elimination of so-called caliphate." Only about 12 hours earlier, U.S. President Donald Trump made a similar declaration, telling reporters traveling with him aboard Air Force One that IS had been "100 percent defeated." But Trump's announcement was quickly refuted by U.S. defense officials and the SDF, who said fighting had not yet ended and more airstrikes were being called in. "ISIS's loss of territory is further evidence of its false narrative, which tries to legitimize a record of savagery that includes brutal executions, the exploitation of children as soldiers, and the sexual abuse and murder of women and children," he said in a statement. On Saturday, the SDF's Kobani was careful to note that while IS' caliphate had finally been brought down, the danger is far from over, with numerous IS "sleeper cells, which continue to present a great danger in our region and the wider world." "While this is a critical milestone in the fight against ISIS, we understand our work is far from complete,"Acting Secretary of Defense Patrick Shanahan said in a statement. "We will continue our work with the Global Coalition to deny ISIS safe haven anywhere in the world." One senior defense official warned IS still has, at minimum, "tens of thousands" of fighters and supporters across Syria and Iraq, and that much of the group's senior leadership, including self-declared caliph, Abu Bakr al-Baghdadi, remain at large. There also are concerns that IS has thousands more supporters and sympathizers — including upwards of 60,000 people who have surrendered since the SDF and coalition launched their final assault last month.